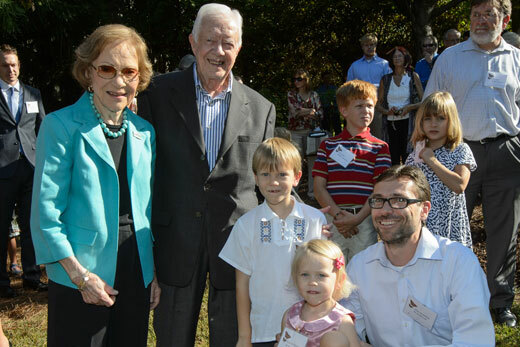 Garden party: On his 90th birthday, former U.S. President Jimmy Carter and his wife, Rosalynn, celebrated in their new pollinator garden. Among the guests was Emory evolutionary ecologist Jaap de Roode, bottom right, and his children Jakob and Ella. 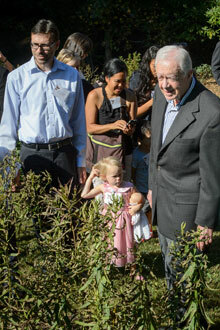 Emory University evolutionary ecologist Jaap de Roode (left) overlooks the new garden with former President Jimmy Carter. Former U.S. President Jimmy Carter celebrated his 90th birthday at The Carter Center today with a tour of a new butterfly garden created in his honor. The Jimmy and Rosalynn Carter Pollinator Garden at The Carter Center, created with the help of Emory University evolutionary ecologist Jaap de Roode, is filled with flowers and plants native to Georgia and is part of the Rosalynn Carter Butterfly Trail, developed by the former first lady to draw attention to the plight of diminishing numbers of migrating monarch butterflies. The garden is certified by Monarch Watch as an official monarch way station, and is listed as a certified wildlife habitat of the National Wildlife Federation. De Roode and undergraduate students from his lab worked with volunteers from Trees Atlanta to provide seedlings for the garden and to plant them over the summer. They will continue to help monitor and maintain the plants. The garden features two species of milkweed, the host plants monarch caterpillars need to complete their life cycle, and a variety of plants that can host Georgia’s state butterfly, the Tiger Swallowtail. An array of nectar plants also will appeal to other pollinator species, particularly bees and wasps, and to birds. Visitors are welcome to drop by the garden, which also features two Japanese-style arbors made by local artist Jesse Reep. De Roode’s lab is one of only a few labs in the world devoted to the study of monarch butterflies and their parasites. In 2010, the lab discovered that monarchs use the toxic chemicals in certain species of milkweed to rid themselves of harmful parasites. Every year, millions of monarchs from Canada and the United States fly south to overwinter in Mexico. Due to declining amounts of milkweed, from pesticide use and development of land, the number of monarchs making the migration has dropped dramatically, from an estimated180-900 million in 1996-1997 to an estimated 6.7-33 million in 2013-2014. Initiatives such as the Rosalynn Carter Butterfly Trail can help reverse the trend, he adds, and encourage individual gardeners to lend more support to monarchs by planting milkweed. The trail, which begins in Plains, Georgia, now includes registered sites extending as far as Canada. Born on Oct. 1, 1924, Jimmy Carter served as the 39th President of the United States from 1977 to 1981 and joined Emory’s faculty in 1982, the same year he established The Carter Center. He is the University Distinguished Professor at Emory.